The popliteal fossa has the semitendinosus and semimembranosus medially and the biceps femoris laterally. 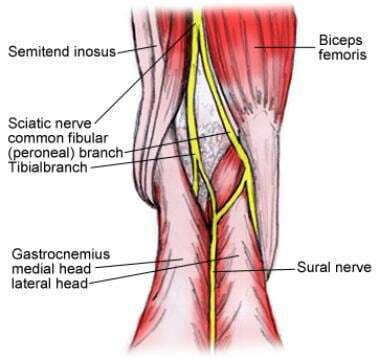 The sciatic nerve divides into the tibial and common peroneal nerve about 5–12 cm proximal to the popliteal crease. The sciatic nerve has a common epineural sheath that envelops the nerve trunks of the tibial and common peroneal nerve from their origin in the pelvis. The tibial nerve supplies the heel and the sole of the foot. The common peroneal, also known as the common fibular nerve, innervates the lateral aspect of the leg and dorsum of the foot. The medial aspect of the leg below the knee is the only area of the lower leg not innervated by one of the sciatic nerve branches; it is innervated by the saphenous nerve. The saphenous nerve is a cutaneous extension of the femoral nerve. At the popliteal crease, the nerves are midway between skin and bone. They are lateral and superficial to the popliteal artery and vein in a separate sheath. The tibial nerve is the larger of the 2 divisions and runs in the middle of popliteal fossa passing inferiorly through the 2 heads of the gastrocnemius. The common peroneal nerve follows the tendon of the bicep femoris along the lateral margin of the popliteal fossa. It is more lateral and superficial than the tibial nerve. Patients do experience moderate discomfort during a popliteal block because the needle traverses through the biceps femoris. A popliteal nerve block is indicated for pain control perioperatively or postoperatively below the patella, the distal two thirds of the lower extremity especially for the ankle or foot but works well for the calf and Achilles tendon. This block provides great analgesia for a calf tourniquet as well. It does miss the medial aspect of the leg, which is innervated by the saphenous nerve, a cutaneous extension of the femoral nerve. A popiteal block in conjunction with an ankle block provides significantly better pain relief than does an ankle block alone for forefoot surgery. Relative contraindications are coagulopathy or systemic infection. Infection is avoided by using strict aseptic technique. Hematomas are avoided by preventing multiple passes of the needle into the biceps femoris or the vastus lateralis muscles. Avoid placing the needle too deep; the vascular sheath is medial and deeper to the sciatic nerve. Vascular puncture: As mentioned above, don’t advance the needle too deep. Nerve injury: Avoid epinephrine or placing a tourniquet at the injection site. This will decrease the chance of nerve ischemia. With nerve blocks, nerve injury is always a possibility. Avoid contact with the nerve bundles, and advance the needle slowly. Stop when a "pop" is felt entering the nerve sheath. Do not inject if high pressure is felt. Do not inject if patient experiences pain. Readjust the needle when the above scenarios are experienced. Most of the time, the needle needs to be withdrawn slightly. Inject slowly and without excessive pressure injecting. This is an extremely rare complication. Necrosis: Necrosis of the heel has been reported. This is due to numbness at the heel, causing a pressure point when resting. Instruct the patient to use a heel pad or frequent repositioning. Canales MB, Huntley H, Reiner M, Ehredt DJ, Razzante M. The Popliteal Nerve Block in Foot and Ankle Surgery: an Efficient and Anatomical Technique. J Anesth Clin Res. 2015 Aug 24. 6:2-7. Above, PN and TN together. Below, TN and PN separate. PA=Popliteal artery, PN=Common Peroneal nerve, TN=Tibial nerve. Reproduced with permission.